I love baking with kids. One of my favorite kitchen assistants is my niece Sophie. She asks 101 questions, makes ingredient suggestions, follows my directions attentively and she’s only four years old. We always make time for baking because we have so much fun together. At her last visit, we decided to play pasteleria and make little panques with my new mini-bundt cake molds. Although my niece loves chocolate, I decided to go with a vanilla recipe and teach her all about where vanilla comes from. Vanilla pods are fascinating to me and I knew she would be in awe when I show her that vanilla isn’t just an ice cream flavor. Before we started baking, I pulled out a vanilla bean and asked her if she knew what it was. Her eyes widened and said “un gusano!” – a worm! I said “No, silly. It’s a vanilla bean.” “Es un frijolito largo, largo” – a long, long bean. Her eyes widened more. We inspected it closely. With eyes closed, we sniffed the rich aroma of natural vanilla. I asked her to describe the texture of the bean and she said “wrinkly and slippery”. It’s oily, I said. Cutting it open and seeing the tiny little seeds ooze out of the bean was the most amusing moment for both of us. The expression on her face was priceless. We discussed in what other dishes vanilla may be added. “Cakes! Churros! Ice cream floats!” she suggested. All correct! Cooking with kids and focusing on one ingredient at a time is a great way to incorporate teaching and learning. Moments like these only come once in a while because our kids grow up so quickly. Cherish them to the fullest. 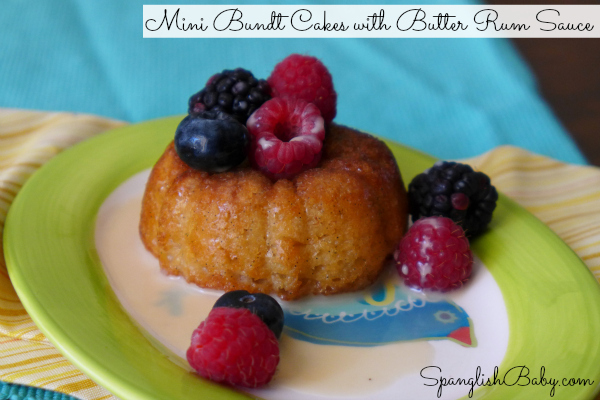 Below is our recipe for the Mini Bundt Cakes with Butter Rum Sauce. The rum sauce was my idea and is completely optional. Omit for kids. Adults will not get enough of it. Spray a mini bundt pan tray with non-stick cooking spray. In a large bowl, combine flour, pudding mix, baking powder, baking soda and salt. Set aside. With an electric hand mixer, mix sugar and butter until smooth. Add oil, eggs and vanilla bean paste. Continue to mix with hand mixer and gradually add in flour mixture until well combined. Pour batter in prepared mini-bundt cake pan molds. Bake for 60 minutes or until a toothpick inserted in a bundt cake comes out clean. Cool in pan and invert on a wire rack. In a small saucepan, over medium heat, combine butter, milk, sugar and rum. Whisk together and bring to a boil. Remove from heat and let cool. With a small fork or toothpick, poke holes in each bundt cake and brush butter rum sauce over cakes. To serve, drizzle remaining sauce over cakes and garnish with fresh berries. I am in the process of making your recipe and I noticed that you said to combine flour, baking power, baking soda, etc in a bowl and leave it. How much baking soda goes into your recipe? Thank you and I can’t wait to try these when they are done! It should be 1/2 teaspoon baking soda. Thanks for catching that! Let me know how you like them!